We love Skoki Lodge in Alberta’s scenic Rocky Mountains. 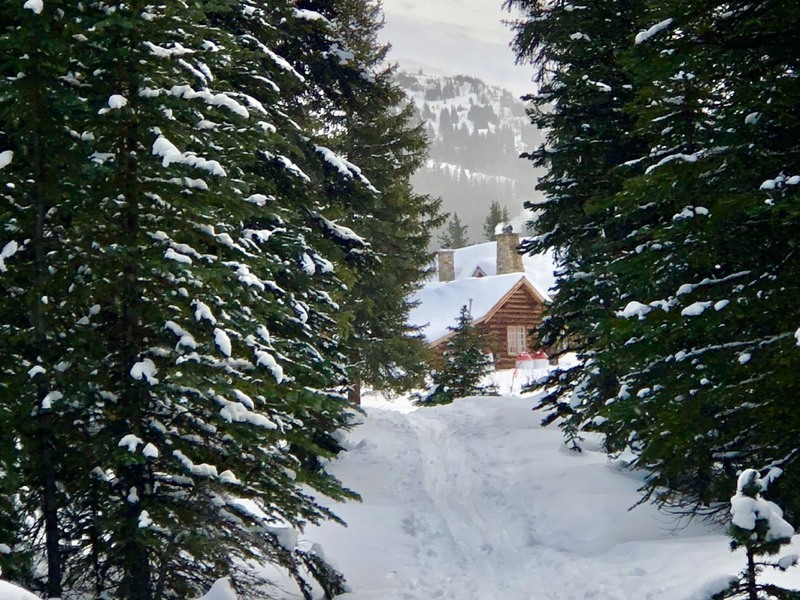 Located near Lake Louise, Skoki Lodge is a wonderful old ski lodge only accessible by ski and snowshoe in winter. A trip to Skoki Lodge should be on everybody’s bucket-list. You can get to Skoki either by snowshoe, light touring skis or alpine touring skis. 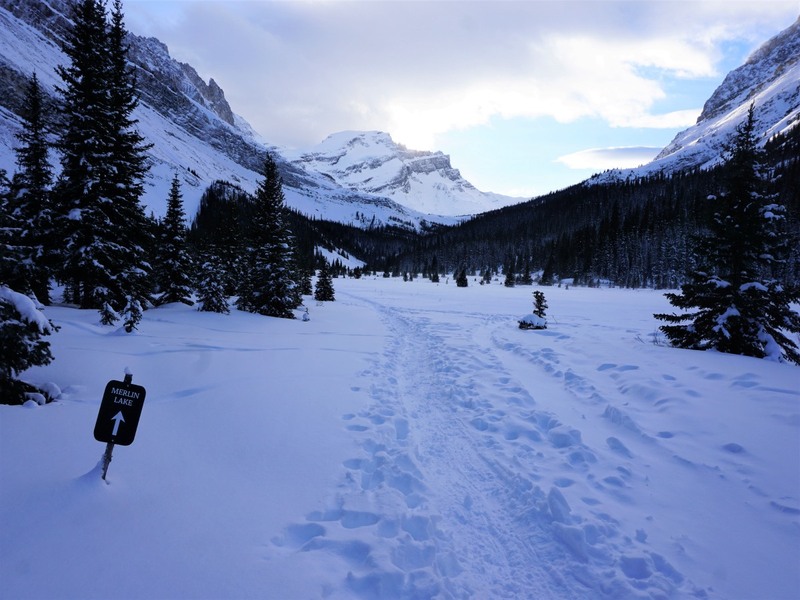 Some people even use their XC skis to get to Skoki Lodge, however that wouldn’t be our preferred way to go if we wanted to tour any of the trails near Skoki Lodge. Along the way, you’ll share many nights with your fellow pilgrims in albergues, which are hostels that provide respite to pilgrims on their journey. Most albergues cost less than 10 euros a night, and some even provide a hot meal for weary travelers. Nearly all towns along the way have restaurants that offer a 10 euro pilgrims menu that includes a four-course meal and a delicious bottle of red wine. The one drawback to albergues is that they have a curfew and an early check out time. If you need a night on the town, or a morning to sleep in, you can rent a hotel in a few of the large cities. If you are feeling rugged you can sneak off the trail and pitch a tent. Be aware that you are not allowed to camp at most places along the way, so do not plan to camp the entire journey. Skoki Lodge is the only accommodation in this region. Skoki was built in 1930-31 specifically for winter ski-tourists, with an addition in 1935-36. You can stay in the main lodge or in nearby cabins. In summer, the cabins are the preferred choice, as they are more private. In winter the decision is more difficult, as moving from your cabin to the lodge means putting on extra clothes and traipsing through the snow in cold weather. If you are a light sleeper, the cabins are probably the way to go in winter, though if you’re ok with a bit of noise (squeaky floors, snoring from other rooms) then we prefer the lodge. The lodge is also a bit cheaper. 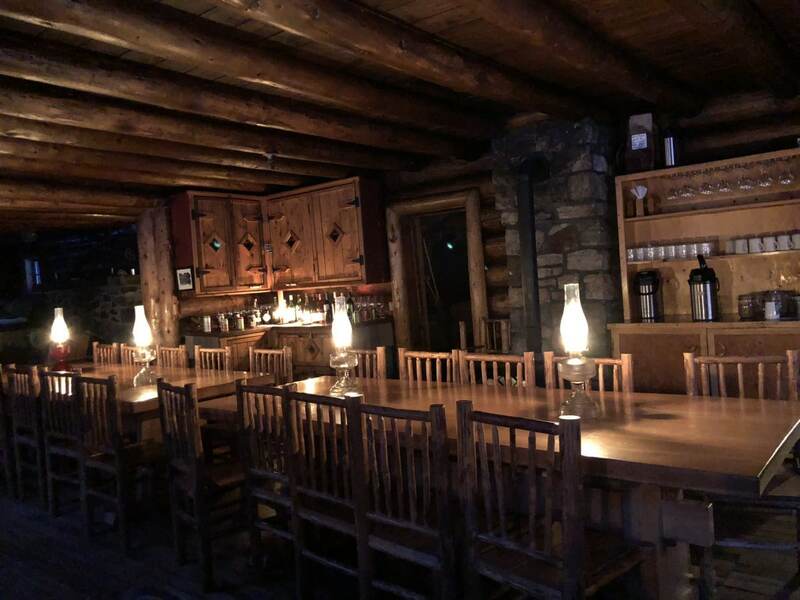 While this is an all-inclusive rustic retreat, with a heavy dose of Canadiana, you shouldn’t expect great luxuries at Skoki, in fact that’s kind of the point. There is no power, Wi-Fi or cell phone service. The toilets are outhouse pit toilets, which will be a lifelong memory if the weather is -30 C.
Inside the lodge it is 100% rustic charm. There are lots of cozy spaces to read, drink tea and enjoy freshly baked goods. Meals are often the highlight at Skoki, with big breakfasts, healthy pack-your-own lunches, afternoon tea and large evening dinners. All food is included in the nightly rate. Most people to go Skoki for anywhere from 1 to 7 nights, though we think 2-4 nights is really the perfect amount of time, as that gives a good time to explore and you don’t feel rushed. You can only get to Skoki under your own power, so going for 1-day isn’t a great option, as you can’t explore the area. Once at Skoki your trips around the area are unguided, though staff can recommend routes for you. There are some great places to ski and snowshoe. All this luxury comes at a cost though, with prices starting at $195/night per person. Cabins cost more, as do weekends. Access to Skoki Lodge is a van transfer from the Skoki Lodge parking lot to the trailhead, which is near Temple Lodge, in the Lake Louise Ski Area. If you are on AT skis, you can take the gondola up and ski down to the lodge. From Temple Lodge you have an 11.2km snowshoe or ski along a clear trail with some wonderful views. The route gains 440m of elevation and drops 350m of elevation. 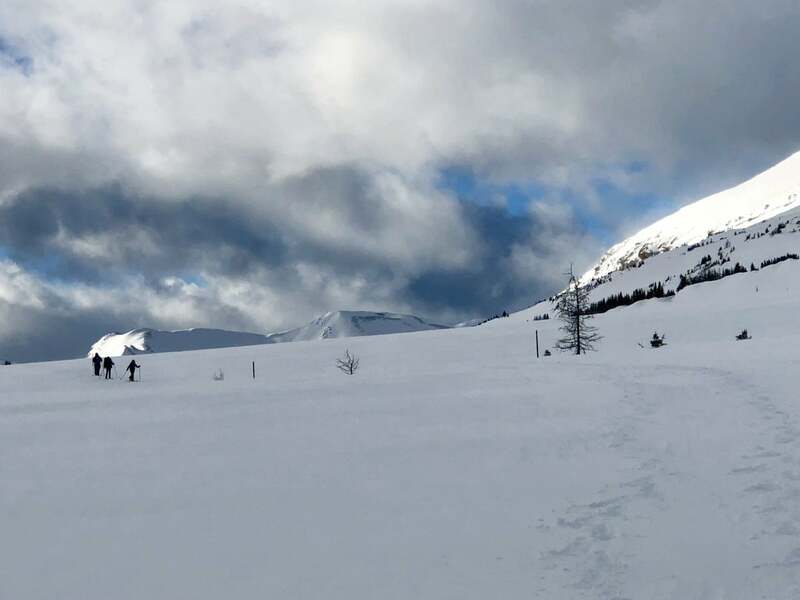 The trip takes 3-5 hours for most people, however on our recent trip the final group to make it in took 7+ hours as they were new to ski touring. The hardest part of getting to Skoki is finding the trailhead. You’ll be dropped off by the van near Temple Lodge. Ask the driver where the Lodge is, as it’s easier to get orientated. Go towards the lodge, you’ll be heading NE, passing underneath the Larch chairlift and going over several ski runs (watch out for skiers!). Head for a break in the trees roughly 100m uphill from Temple Lodge. There is a large sign here, and once in the trees the route finding gets a lot easier. If you’re coming from Temple Lodge, walk out by the ski racks and turn left, walking uphill on the Marmot ski run. After 100m you’ll see a path going to your left. The route to Skoki Lodge is largely in the forest for the first 3.5km, though once it gets into the alpine you have wonderful views of Redoubt Mountain, Whitehorn Mountain and Ptarmigan Peak. You’ll likely see a path leading off to your left at roughly 3.75km. This goes to the spartan Ptarmigan Hut, also known as Halfway Hut. There is nothing in the hut except a table, however it does provide protection if there are strong winds. 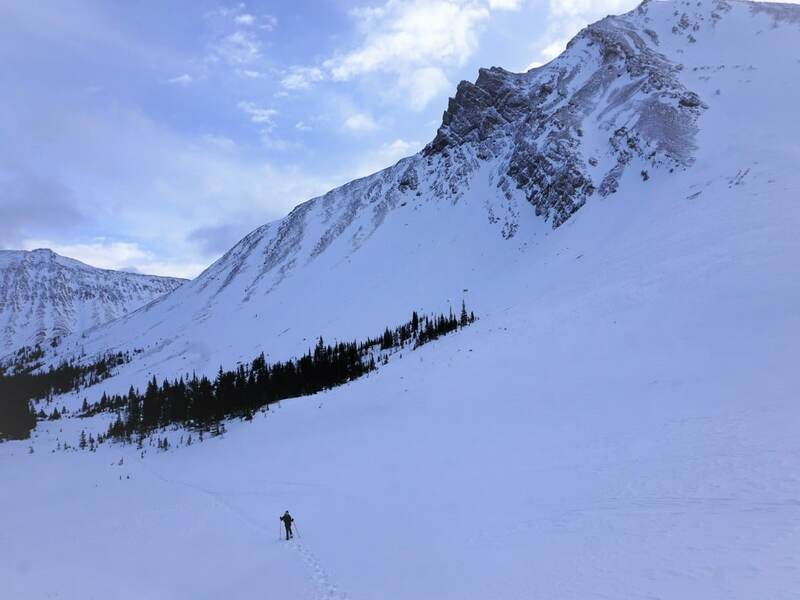 Coming out of the hut, continue up the valley and then climb over Boulder Pass, a smallish pass that may require you to take off your skis early in the season if the rocks aren’t covered. Once over Boulder Pass you descend to Ptarmigan Lake. It always seems to be windy here, so bundle up. Thankfully, there are stakes driven into the ground to follow, as doing this in a whiteout is challenging to see where to go. At the far end of Ptarmigan Lake and to the left is Deception Pass – and deceptive it is. It looks easy, however it can really tucker you out as you climb up. Take time to look back from Deception Pass to the wonderful views in all directions. From Deception Pass follow the stakes at the start into open terrain and angle down to your left. This is a popular place for Skoki guests and staff to find powder turns, so you’ll likely see lots of tracks around here. Once at the bottom of the valley follow a well packed trail to the lodge. You’ll smell the wood smoke a few-minutes before you make it to the lodge. There are so many great ski trails near Skoki, but not the long, steep descents that are more common in the Selkirks or the Monashees. Furthermore, the Canadian Rockies snowpack is known to be a tricky snowpack, with regular avalanches.  Those looking to find ski turns should have Avalanche training. The staff at Skoki Lodge can provide recommendations of where to go skiing, however below we list two of our favourites. This is a great trip for the afternoon you arrive at Skoki. Head out from Skoki Lodge and go right, heading downhill through the trees. As you come to the valley bottom you should see paths that head out to your left. This is the wonderful Merlin Meadows. Our map shows just a quick exploration of Merlin Meadows (it was -28 C out! ), however you can explore quite deep into Merlin Meadows, though we find that the tracks get wind-blown and can be hard to stay on the existing tracks. This can mean you end up waist deep in the soft, powdery snow. There are some turns at the far end of the valley – ask at Skoki how to get to them. You’ll need avalanche training if you plan to ski them. This is a great tour, and the last time we did it we got to put in the tracks for 75% of the route as we were the first group to do it that year. We prefer to do this route on snowshoes, as the end is steep and tricky on light touring gear. From the lodge turn left and head back towards Deception Pass. You’re looking for a turn to your left, and you’ll note on our map we took a trail a bit early that ended up going nowhere. The actual left-hand turn comes roughly 500m from Skoki Lodge. From the turn the path rises up between Skoki Mountain and Fossil Mountain before descending to Red Deer Lakes. Part of the trail here is an exposed terrain trap for avalanches from Fossil Mountain, so try and stay in the trees and move through this area with quite a bit of spacing. You’ll obviously also want some avalanche training. As the path opens up you’ll come to Red Deer Lakes backcountry campground (roughly 4km from leaving Skoki Lodge). This is a wonderful place for a break with expansive views everywhere you look. From here the trail heads NE. We were unsure of ice thickness on Red Deer Lakes, so we contoured around the left-hand side with one quick crossing over the southern and northern ends of Red Deer Lake. This was a fun route as we had wonderful views looking over the lake. After snowshoeing 2km you get to the end of Red Deer Lake, where you go along the Little Pipestone Creek for a short while before going left (west) and climbing through the trees. This next stretch of trail is the least beautiful part of the trail, however the trees and snow make it very tranquil. You steal views through the trees occasionally. As you go through the forest you have regular ups and downs. This means you’ll need your skins if you’re on skis. There are two big descents that are quite steep as you return to Skoki. These descents are fun on snowshoes, however they would not be fun for novice or intermediate skiers. Once you reach the valley bottom you find yourself at Merlin Meadows. If you haven’t explored them already, it’s worth heading out to Merlin Meadows, which are to your right. 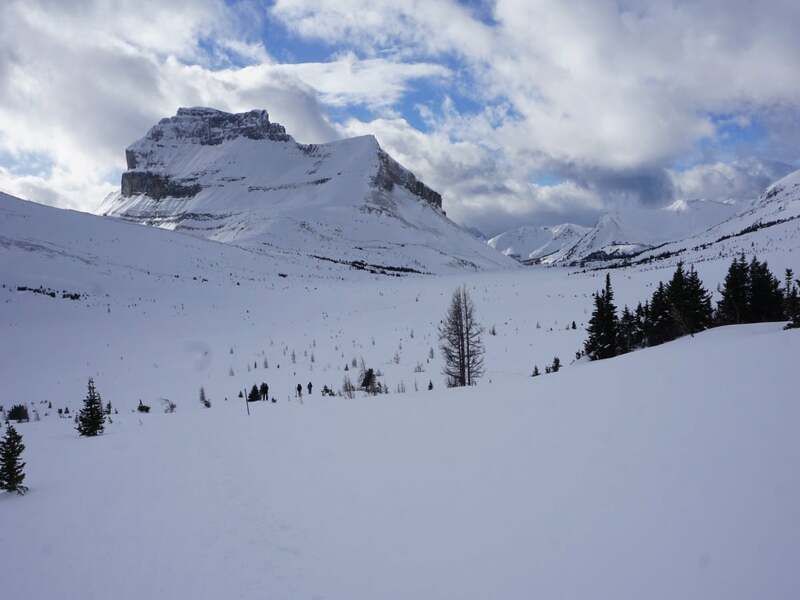 The final part of the trail is a 100m climb back to Skoki Lodge. The total trip is 10.7km, with 170m of ascent and descent. It’s easier, as you only gain 315m but descend 865m. You don’t get a van pick-up at Temple Lodge. You must snowshoe (or ski) the extra 3.1km along the ski-out ski run. Follow the trail you came in on back to Temple Lodge. The only challenging part of this route is the climb back up Deception Pass. Once over Deception pass you will hopefully get a tail wind pushing you across Ptarmigan Lake. The ascent of Boulder Pass on the other side of the lake is a breeze, though skiers often take their skis off coming down off Boulder Pass as it can be quite rocky. The trail from the base of Boulder Pass back to your car is great on skis as it’s slightly downhill almost the entire way. It’s not too bad on snowshoes either. Once you are back at Temple Lodge head back to where the van dropped you off. You’ll see that there is a ski-trail (ski-out) beside the road. Get on this ski out and head down towards your vehicle. This trail largely follows the route you drove in on, however there is enough distance between the two routes that you don’t see the road that often. Make sure to keep your eyes open for your parking lot, it’s easy to miss it. If you come to a road go left to where you parked your car.